Posted January 13th, 2012 by Karl & filed under MailBigFile, MailBigFile News. A week comes and then a week goes. We’ve hit the week’s pinnacle at Friday and it’s time for another top five. 1. Service Update – Re-Styling The Navi Bar. 2. Service Update – Accessibility Improvements. 3. New Feature – IP Address To the File Tracker. 4. Bug Finders Wanted; Will Give Free Pot Noodle. We like the way MailBigFile looks and generally decide not to tamper with it too much, however recently it’s come to our attention that the navigation bar at the top might not be as intuitive as it could be. So, we’ve sought to rectify this misdemeanour and made a slight alteration to how the navigational links on the navi bar are displayed. Gone is the big green on the ‘free’ part of the navi bar and they should be coloured to denote what part of the site you’re currently on instead. In a previous version of our top 5 list, we vowed to improve the accessibility of our website by making it better tailored to the hard of sight. Well, we have now begun work to properly put this in place. We’ve recently then made these such improvements to the free part of the service, and if you use screen readers of any kind, you should be able to see this improvement there now. Of course, if you still feel it’s under par, do let us know and we’ll try our best to accomodate where we can. We’ve also now added the IP Address of the downloader from your file. This should help you keep track of exactly who is downloaded your files at the time. You can find this by going into your Upload History and clicking on “Track” next to the relevant file. Not long ago, Facebook recently unveiled they were willing to pay anyone a sum of money for each and every bug that they could find on the website. As we’re looking to make some backend improvements and changes, we’re now also looking for the same but with us, we decided to offer something far more valuable than money. Something only £1.10 (or so) can buy; a Pot Noodle. 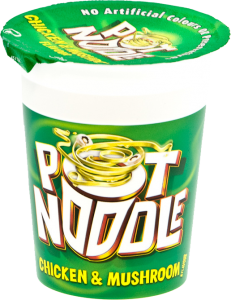 As we know everyone loves Pot Noodle’s, we believed this was the most cost-effective method of rewarding our loyal customers with their hard work and diligence. But, in all seriousness, any bugs that you do find would be very welcome. Should you find any bugs on the site and wanted a Pot Noodle for your efforts, feel free to request one! For those of you unaware or who haven’t completed it yet, our Service Improvement Survey can be found here. But we’d just like to thank everyone for their contribution to the survey and all the data we’ve managed to pull in as a result. We’ve taken word of every response that’s come through and even added a list of survey ideas and suggestions that you’ve put forward. If you’ve got an idea that you’d like to see on MailBigFile then we’d love to hear from you!